The Apple Watch Series 4 will gain the much hyped ECG functionality when the next version of watchOS is released. 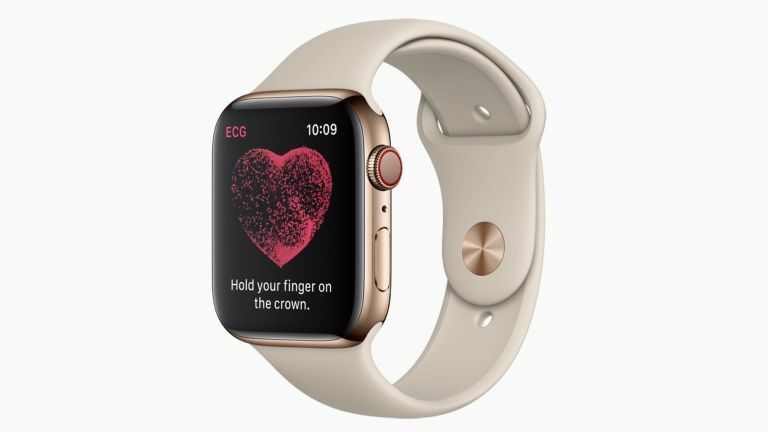 The echocardiogram sensor was one of the most talked about features during the launch in September, with the smartwatch able to take an ECG reading when users place a finger on the Digital Crown. The ECG app, which will be installed with the new software update, will indicate whether your heart rhythm shows signs of atrial fibrillation (a serious form of irregular heart rhythm) or a normal sinus rhythm. The feature wasn't quite ready at launch, but has been in beta testing since November 7 (according to an internal Apple Store training document obtained by MacRumors). Apple Store employees are instructed to advise customers that the ECG app is "not intended to be a diagnostic device or to replace traditional methods of diagnosis," and "should not be used to monitor or track disease state or change medication without first talking to a doctor". It will arrive with watchOS 5.1.2 and iOS 12.1.1. Both software updates should be released soon. The bad news? The ECG function will only be released to Apple Watch users in the US, where Apple has received FDA clearance. If you live outside of the United States you'll need to wait until the Series 4 receives government approval first. There's no telling how long that will take. Of course, the new feature is also only coming to the Apple Watch Series 4, although watchOS 5.1.2 will bring irregular heart rhythm notifications to older models. The new heart monitoring features will be recorded in the Health app on a paired iPhone. You'll need an iPhone 5S or later running iOS 12.1.1 (currently in Beta) or later.